Think about the number of times you visit the barber shop, the movie shop or the grocery store. Chances are you have built loyalty with the same dealer spanning months or even years. However, there is not much to show for your loyalty. This however, is about to change with M-Zawadi, a cardless loyalty platform. M-Zawadi is a USSD and Web based loyalty system for both businesses and customers. The idea was born when CEO Naftal Obwani took a cab and was given a free ride by a taxi service. Naftal saw an opportunity in providing a structured loyalty program for the SMEs from barbers to grocery stores and even movie shops. The solution is also applicable in online merchant stores. M-Zawadi has been in existence for 8 months with 2 months spent conducting research on the local and global loyalty system through interaction with would be clients, following trends in loyalty and getting to understand the basics of loyalty systems. M-Zawadi which launches today has been in pilot for the last two months in different merchant stores. “With M-Zawadi, we are trying to solve the problems of bulkiness with loyalty cards and most importantly solve the perception that loyalty reward systems only belong to the big stores”, said Naftal. “It costs $5 per card making roll out of a card system. Add the infrastructure such as servers, back-end systems, it becomes expensive for SMEs”, he added. For customers, they need to first register on the platform which can be done via USSD or an android app. Users with feature phones or who prefer to use the USSD module dial *415*100# from their mobile devices, which then ushers in an option to register. After following the prompts the user can then begin earning points. The user can also download the app from the Google Playstore. Upon registration, the user can then earn points every time they shop at an outlet registered with M-Zawadi. The merchant asks for the mobile number of the user and then transfers points to them based on their value of shopping. Assume you visit your barber and your haircut costs you 500/=. The barber then asks for your number and having registered, they award you with points based on their pre-determined reward system. Customers can receive information on deals as well as redeem their accumulated points. M-Zawadi also offers users the ability to transfer their earned points to other users. The solution is especially effective for merchants and is available via web, POS and App. For users with a physical POS but lack the internet, the M-Zawadi API allows for the storage of the data locally to be accessed when the internet become available. For the merchant, a customer’s number becomes their unique identifier, through which they can reward the user with points for transactions. The awarding of the loyalty points takes place via a smartphone where as a merchant you ask for the customer’s number, enter the amount they purchased they receive the points. M-Zawadi also provides users with a back-end, accessible via web. The back-end provides the merchant with business intelligence modules where they can map consumer purchasing behavior. They can also generate critical insight on specific customers such as the number of visits and which products purchase the most. Importantly, the business intelligence modules can allow a small business with multiple branches view the performance of each branches. There are numerous loyalty solutions primarily delivered via card. M-Zawadi is looking to eliminate the expense of card by delivering a seamless solution via mobile devices. The infrastructure and the solution in its entirety is delivered via the web under a SaaS model, where the merchants lease it for a monthly basis. “What we offer is a solution where users do not need to invest resources into infrastructure rather, they can on the go begin offering their customers the advantages”, says Michael Karume, head of Business Development. In addition to the business intelligence tool, M-Zawadi merchants can easily pass information to users about deals they offer via both App and SMS. The android app has a deals segment that highlights all the available deals. A customer say of a shoe boutique sees the deal from the app and clicks on the follow button. In the back-end, the shoe merchant receives an alert that a certain customer is interested in the deal. The app has an in-app instant messaging service that allows the merchant and customer to communicate about the deal . From the back-end too, the merchant can generate reports on all the activity taking place. An interesting proposition by M-Zawadi allows for cross-industry coalition. Think of partnerships formed between companies such as an oil marketer and a telco, where users can pay for oil via mobile money service. M-Zawadi thus allows for the accumulation of loyalty points from customers who take advantage of the offer presented by the partnership. In addition, users are not limited in where they redeem their points between merchants. 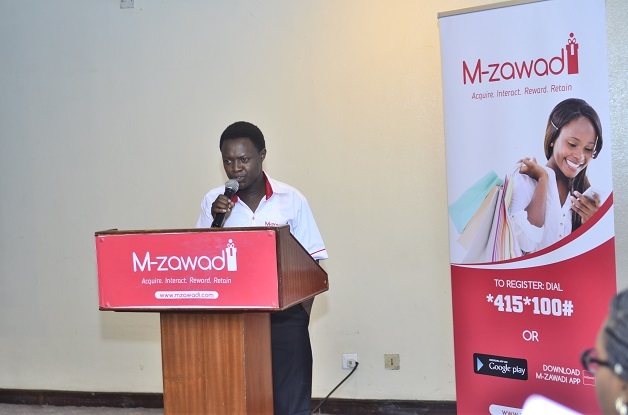 M-Zawadi is looking to forge partnerships between complimentary companies where points can be redeemed between each other. Assume I have points from my favorite coffee store and would like to have Pizza. Based off my points, I should be able to redeem them for the Pizza at these stores. For customers, you get to redeem your points for different product offerings. M-Zawadi offers the merchant store a code that resembles a Paybill number that you use to redeem. The process of redeeming and transferring these points is instant. The platform is also delivered on a mobile platform owing to the rapid growth of mobile in Kenya. At the moment, leading Telco Safaricom has 7 million customers using smartphones with the number growing. The delivery of the POS solution on a mobile platform is therefore sustainable. The roll out to market is set to begin following the launch with clients such as SupaDuka, who were in the pilot moving becoming full fledged clients.